Our Luxury Subframe system is comparable in slimness to our Economy Odd Leg system, but provides a nice clean and even finish, which helps the secondary glazing to blend in. It has an additional wooden frame that wraps the aluminium frame. The wood used for the subframe is either MDF (Medium Density Fibreboard), Tulip (a pale hardwood) or solid Oak (hardwood). The Subframe comes in different depths; SF1 for face fix, SF3 and SF4 for reveal fixing. 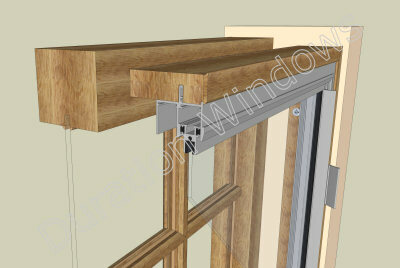 Cover trims are supplied with the system to hide the wooden subframe and the fixing holes. Aesthetically it is a very attractive system, making it highly suitable for domestic applications. Highly suitable for use in domestic applications due to it's clean finish. Can just as easily be specified for commercial applications.